The University of Rochester River Campus and School of Medicine and Dentistry (RC and SMD) were honored to receive the 2013 Green Cleaning Award from American School & University, in conjunction with the Green Cleaning Network and the Healthy Schools Campaign. The award recognizes educational institutions that implement sustainable cleaning practices designed to protect the health of both the community and the environment. The RC and SMD received the Grand Award, the highest level of achievement, in the College/University category. In this category one Grand Award Winner, one Best New Program, two Silver Awards, and one Honorable Mention were conferred. The University of Rochester is proud to be recognized with the highest level of honor for its efforts. The University first began its Green Cleaning Program in 2004. It developed further when the Sustainability Task Force was created, which ultimately burgeoned into the University Council on Environmental Sustainability. The council is comprised of 25 individuals from the University community, including faculty, students, staff, deans, directors of campus planning, finance, facilities and services, student activities, dining, and the provost. The mission of the council is to “conduct an annual review of the University’s progress in environmental sustainability initiatives in operational and academic areas; to establish and maintain communication vehicles for conveying the University’s sustainability initiatives; and to recommend new sustainability initiatives that the University might undertake.” Embedded in this mission is a Green Cleaning Program. In terms of cleaning supplies, the University only uses products certified to be environmentally friendly by organizations such as Green Seal and EcoLogo. At the SMD floor scrubbers are fitted with brushes designed to last one to two years rather than floor pads disposed of after daily use. Both the RC and the SMD use machines called Orbio Units, which electrically convert water into an effective cleaning solution. This employs a sustainable energy form and significantly reduces the amount of chemicals the cleaning team uses. Both campuses wash their cleaning supplies rather than using disposable materials. At the end of each academic year the RC donates unwanted items of furniture rather than throwing them away. In the restrooms, signs have been posted that instruct patrons on effective hand-washing techniques. A program called the Scencibles System has also been implemented in the restrooms on the RC that provides oxi-biodegradable bags for feminine hygiene products. This prevents them from being flushed down the toilet, entering the waste stream, and ultimately polluting the environment. 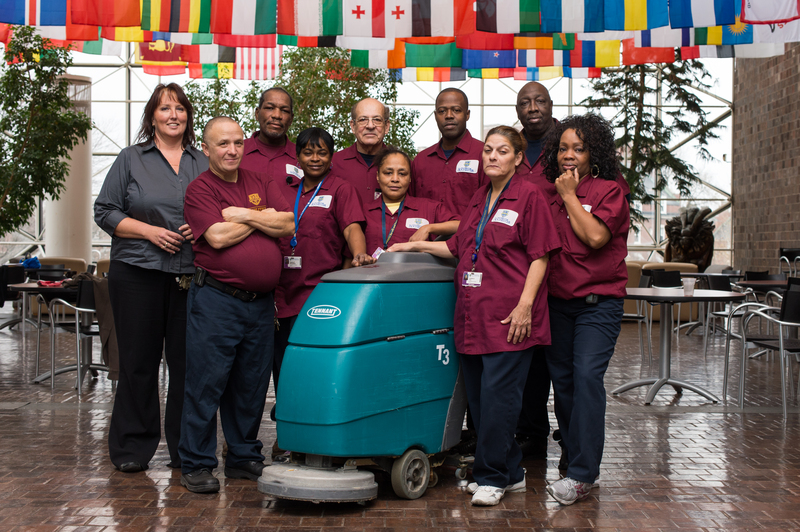 Both campuses train all Environmental Service Workers (ESW’s) on the University’s sustainable cleaning practices. ESW’s learn about green cleaning products, when and how they are best used, proper disinfection, infection control, and much more. After the intensive training period supervisors continue to monitor ESW’s progress and hold updated annual training sessions. While these methods do not detail every aspect of the Green Cleaning Program, they aptly represent the University’s commitment to sustainable cleaning. The University continually strives to move forward with the new technologies of green cleaning and is constantly adapting to adhere to our mission of a clean and healthy environment through professional and courteous service. Photos provided by J. Adam Fenster. RC Environmental Services shown left to right; Area Supervisor Dorrene London, Environmental Service Workers Bobby Lazzara, Dennis Lee, Cherise Richardson, Leo Hodge, Marian Hill, Ron Jefferson, Carmen Cruz, Willie Kearny, and Robin Haten pose with a Tennant T3+ Auto Scrubber. Thank you, Amy for sharing this. It’s an old post, but it was really interesting for me to read it.The competition is open to all types and sizes of education institutions, both public and private, including preschools, elementary schools, middle schools, high schools, universities or colleges, trade or technical schools, and other types of schools (such as K-12, special education or therapeutic schools), as well as school districts. “The University first began its Green Cleaning Program in 2004. It developed further when the Sustainability Task Force was created, which ultimately burgeoned into the University Council on Environmental Sustainability. The council is comprised of 25 individuals from the University community, including faculty, students, staff, deans, directors of campus planning, finance, facilities and services, student activities, dining, and the provost. The mission of the council is to “conduct an annual review of the University’s progress in environmental sustainability initiatives in operational and academic areas; to establish and maintain communication vehicles for conveying the University’s sustainability initiatives; and to recommend new sustainability initiatives that the University might undertake.” Embedded in this mission is a Green Cleaning Program.”,Bravo!! !.Thanks for sharing with us.